The story on Gamestar Mechanic is divided into multiple Quests to help you master your gaming skills— however, if you don’t have a Premium account, you will be automatically directed to the first one. 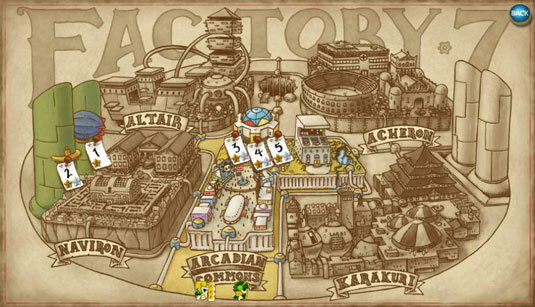 Quests are divided into episodes, collections of games that tell a story in each location. The episodes themselves consist of several missions that split the story into large components. After you complete the first episode of Addison Joins the League, you’re given a map that appears whenever you enter a quest. The map contains numbered notes representing each episode, pinned wherever the episode takes place. 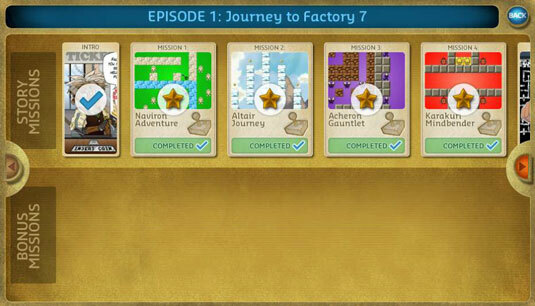 Scroll over a note to see a pop-up description of the episode, followed by two rows of beige rectangles: The rectangles in the top row represent missions, and those in the bottom row represent bonus missions. You see blue check marks over every mission you’ve completed, as well as some text in the bottom-right corner telling you what percentage of the episode you’ve finished. Click a note to play the episode. If you complete an episode, the next episode becomes available. Most missions are games, which you must win in order to access the next missions. Other missions require you to build or repair games with certain restrictions, and publish them (though the result does not go on Game Alley) to continue. Between the missions are cut-scenes, which are animated comics that fill out the story between challenges. You may see these cut-scenes labeled as intro, intermission, or outro, depending on where they are in the episode. Every episode begins with an intro and an outro. Bonus Missions: (Optional) At the bottom; give neat rewards, including sprites, backgrounds, and music not found in the story missions. You can access and complete a series of bonus missions at any time, but they are not required to complete the quest. After you complete a mission, a star appears over it: Story missions have bronze stars, and bonus missions have silver ones. If you complete all of the story missions or bonus missions on an episode, the corresponding note on the main map has similar stars printed on it to acknowledge your completion of the episode. It isn’t always possible to earn a silver star. Don’t worry if you have only a bronze star on an episode — it may have no bonus missions. Some missions may be grayed out on the screen, indicating you can’t play them unless you’ve completed the previous missions. Other missions are marked with stars, indicating that you have completed them — though you’re always allowed to play them again. Play: Win the game to complete the mission. Be sure to analyze the design concept that’s being taught — pay attention to the cut-scenes and in-game message to understand what the program wants you to learn. Repair: Play a game, find out what’s wrong with it, and fix the problem. You are given a limited number of sprites, and some design functions are locked (such as Edit or Clone). In addition, some of the sprites in the level are faded out while editing; these sprites cannot be moved or edited, so you have to build the game around them. Design: Design a game from scratch, using the available tools. The game must fit certain requirements, prompting you to learn about the corresponding element of game design. You can find tutorials for designing games by clicking either the Tutorials button on the Pause menu or the question-mark (?) button in the lower-right corner. These buttons appear only on Repair or Design levels. To succeed in the story missions, you should understand what the designers want you to gain from the experience. For example, some missions use trails of items to guide you through certain movements, and others give you games to repair with particular focuses such as gravity and space. The story missions are meant to teach you the necessary concepts of game design, so be sure you learn these topics in order to understand the purpose of the Quest and gain a better understanding of the program in general.